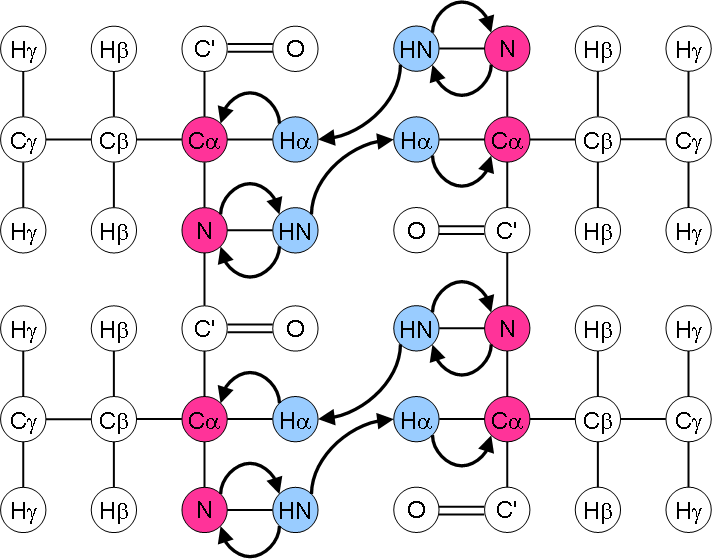 Magnetisation is transferred from 1H to 15N via cross polarisation. In three sucessive steps it is first transferred back to 1H, then to other 1H nuclei nearby, and finally onto 13C for detection. The chemical shift is evolved on the 15N nuclei following the initial cross polarisation and detected on the 13C nuclei at the end, resulting in a 2D carbon-nitorgen spectrum, but which encodes information about proton-proton distances of the protons attached to the carbon and nitrogen atoms. This experiment is particularly useful for obtaining proton-proton structural restraints which can be used in protein structure calculations.